Thank you for joining me as we count down to the next MFT release. We are one day away from the big day! All the new Stamps, Die-namics, and Stencils will be available on Tuesday, March 1 at 10:00pm EST. Be sure to check out the MFT Blog to see all the new items being revealed today. Don't forget to leave a comment on the MFT Blog countdown posts, YOU could win one of the five $75.00 gift vouchers. I have a quick and simple card to share with you today. It features the new Twice the Thanks Die-namics. These dies are going to get a ton of use in my house! I die-cut a piece of Black Licorice card stock and adhered it on top of a rainbow of Glitter Tape. These 6mm glitter tapes are so much fun! Love your strips of color. What a great use of glitter tape! Your card is gorgeous. What a great card! The thank you die is a wonderful font. Very nice simple card. 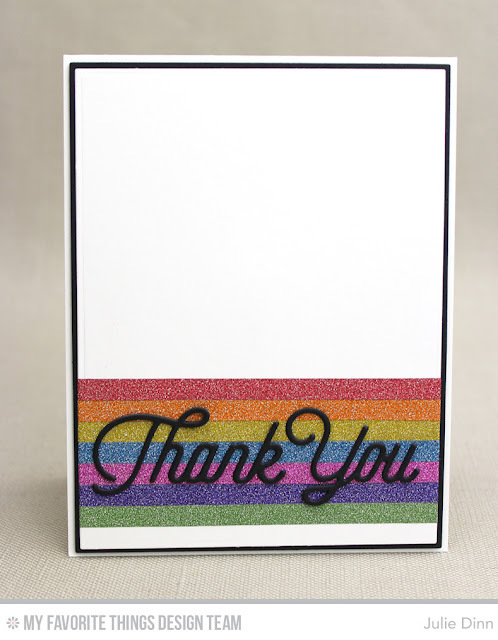 Love the rainbow colors as well as your card design. Love myself some rainbows. This card came out Perfect! The glitter tape looks great. Oh, wow! That sure does sparkle and shine. I just love that look! Oh, I tried to join in on each day of the release but I think some of my comments disappeared. So not sure if I did or not. I did not want to try again just in case I did not see them. At any rate I saw some wonderful artwork. Sweet and simple. The rainbow glitter tape looks great with the new Thanks die.